Skydiving is a thrilling and adventurous sport which can be quickly learned. In fact, depending on your preferred type of parachute jump, the initial training can take anywhere between 20 minutes and 6 hours before making your first jump. The difficult part for many first-time skydivers is deciding which type of skydiving jump they should start with. This page will overview the three main types of parachute jumps: accelerated free fall training, tandem skydiving and static line jumps. Note all these numbers are common convention but specific practices can vary with skydiving centers. 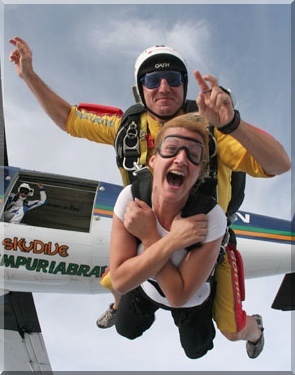 *In general, plan to put aside a whole day for your skydive in case of inclement weather or other unexpected delays. Tandem jumping is one of the most popular and common types of skydiving for the beginners. During this type of jump, the student is attached to the instructor for the entire duration. The instructor will control or supervise the entire jump from exit to landing. In a tandem jump, you can enjoy the thrill of skydiving with minimal training (usually around 10-30 minute briefing for your first jump). In the United States, tandem instructors must be expert skydivers who have passed certification courses, have more than 500 jumps, and 3+ years of skydiving experience. Therefore, tandem skydiving is indisputably the safest type of jump for first time skydivers. After exiting the plane at around 12,000 feet, a tandem jump includes around 45 seconds of freefall, at which point the instructor will pull the parachute at 4000 ft. The parachute ride to the ground will take 5-6 minutes. A static line jump, also known as ‘automatic opening’ is usually carried out from a short height of 3500 feet but can be significantly higher. In a static line jump, the parachute is deployed automatically as soon as the jumper exits the plane. Static line skydiving requires a 3 hour training course and exam for first time static line jumps. This is less training then solo free fall skydiving (AFF) but significantly more than a tandem skydive. Most of the static line training involves learning the nuances involved in safe landing. The downside of static line skydiving is the lack of freefall time. Accelerated free fall training (AFF) is for learning the full skydive procedure for solo skydiving from the exit, freefall phase, pulling the parachute, and landing. For those who are ready to take out some time from their schedule to learn the real deal, AFF gives you the true freedom of skydiving independently. AFF training is only for those who wish to pursue skydiving as a regular hobby and not merely as a single experience. This video shows the first in a series of supervised parachute jumps for accelerated freefall training. Accelerated freefall training requires classroom instruction and hands-on training. To complete the AFF training, the student needs to take 6 hours of class time, pass an exam, and then adequately perform a series of practice jumps with two instructors, before being allowed to solo jump. Solo freefall jumps are identical to Tandem parachute jumps, except without the instructor. They are also significantly less costly, particularly if you bring your own gear.